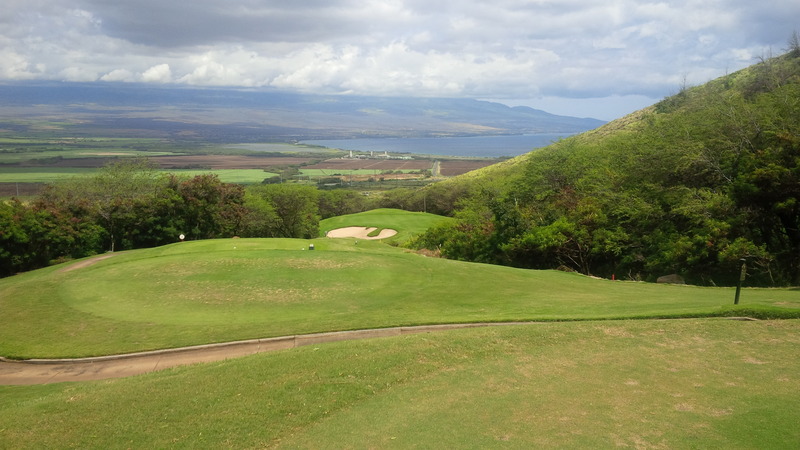 A look down the mountain towards Maalaea Bay from the 1st green at Kahili Golf Course. My hope arriving in Maui was that I had learned the lessons of my Hilton Head golf trip earlier in the year. Don’t play too much golf, stay focused on my fundamentals, and remember to have fun and not take any round too seriously. 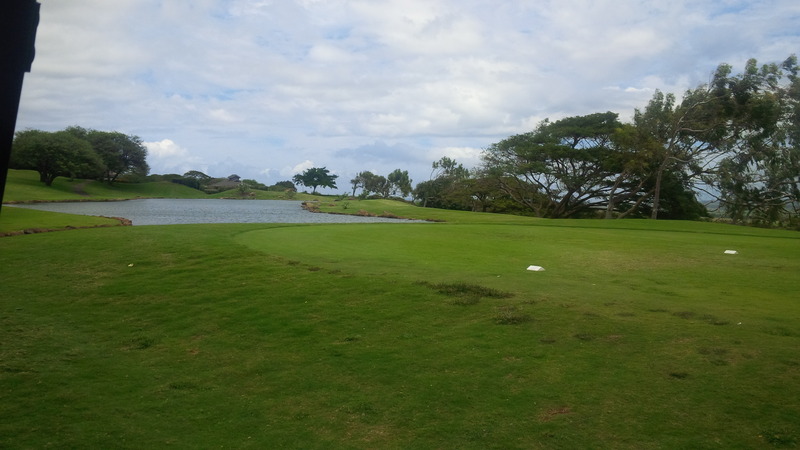 Before I arrived, I resolved to only play three rounds of golf during the week, and I knew that the Kapalua Plantation Course and Wailea Gold Course were going to be two of the three rounds. So, I needed another round to work in early in the week that would allow me to knock the rust from an 8 hour flight off and not break the bank. At times it was hard to keep focused on the course and not be awed at the beauty of the West Maui forests. 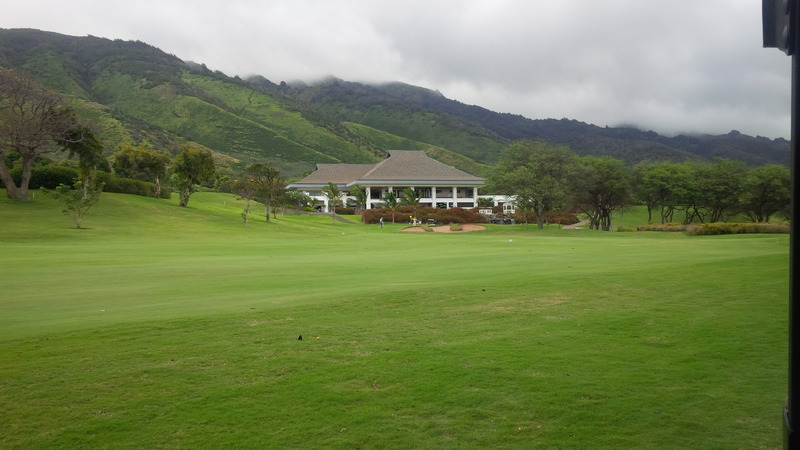 Kahili Golf Course in Wailuku fulfilled both requirements. Kahili is the public half of the 36 holes of the King Kamehameha Golf Club, located on the foothills of the West Maui mountains, smack in the middle of the island. 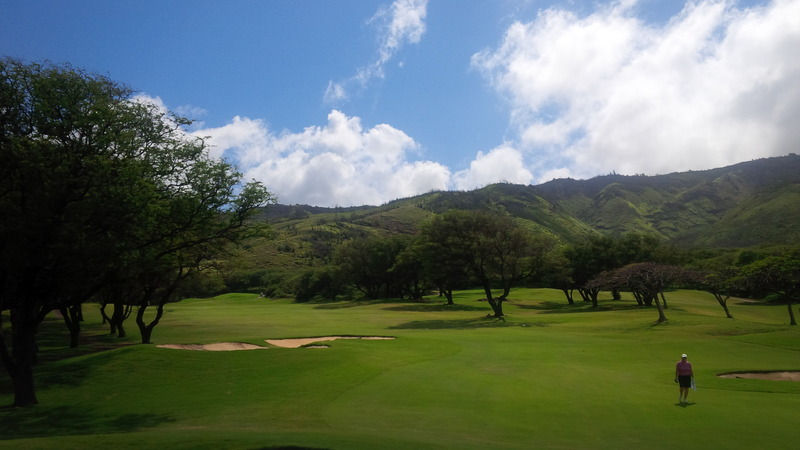 Designed by Robin Nelson, ASGCA, and Rodney Wright, Kahili opened for play in 1991. From the Blue Tees, the course played to 6,554 yards and a slope and course rating of 72.3/135, which was fairly modest by Maui standards. The wind farm a few slopes over on the mountain should have been a signal that wind was going to be a big factor on the day. The wind was fairly calm as we made our way up the first fairway, but it increased the sustained speeds as the round progressed. 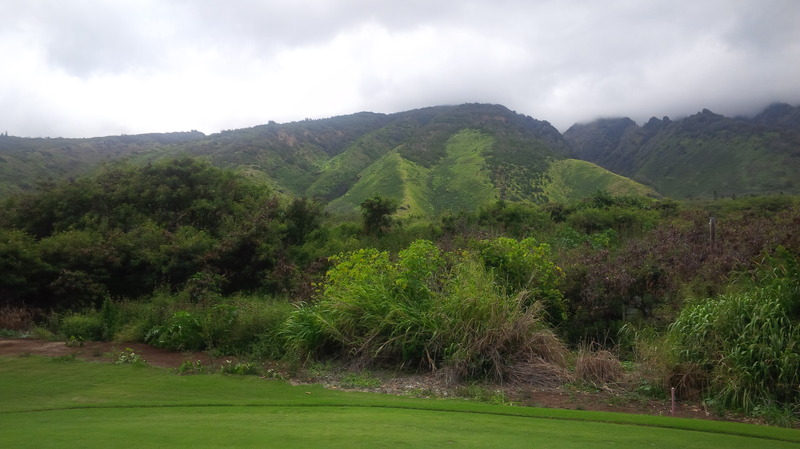 Kahili Golf Course rests at the foothills of the mountains, but only has water in play on a handful of holes. The wind increased the entire round, to the point that it blew my hat off my head in the middle of my swing on the 18th tee. I don’t remember seeing my ball oscillate on the green from the wind, but it I suspect that was due only to the Velcro-like quality of the Grain of the Bermuda green. The wind was an ever-present factor on every golf shot, but certainly not to the point that it detracted from the golfing experience. Despite picking up during the day, the wind was pretty consistent, so it was playable, absent the random surprise gusts. I later learned that Kahili has a reputation as perhaps the most windiest course on Maui, and that our experience was pretty typical. Kahili’s 7th hole is a wonderful short, sharp dogleg down a sizable hill. The course is rarely boring, if ever. 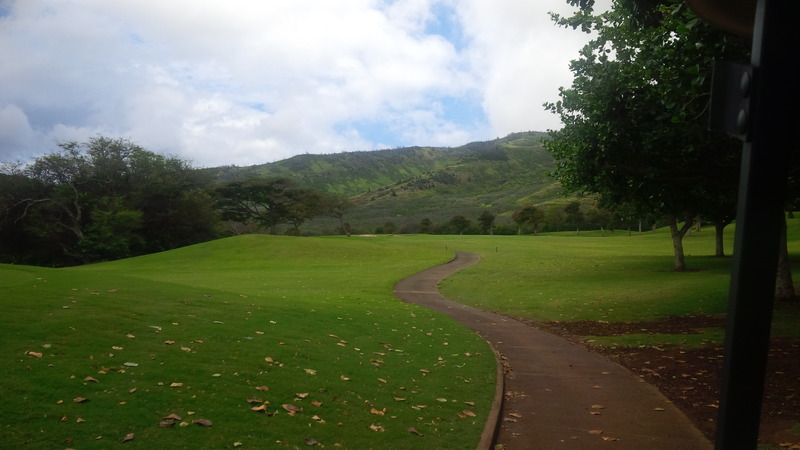 Kahili was a fun and interesting golf course that I can’t easily fit into any particular descriptive style. There are far too many elevation changes to justify an actual parkland designation, but the course generally consisted of orderly, slightly doglegged fairways, separated from other fairways with rows or groves of trees. The course simultaneously provides breathtaking views of the ocean and the mountains of Maui, but it’s neither a seaside course nor a cavernous mountain course. 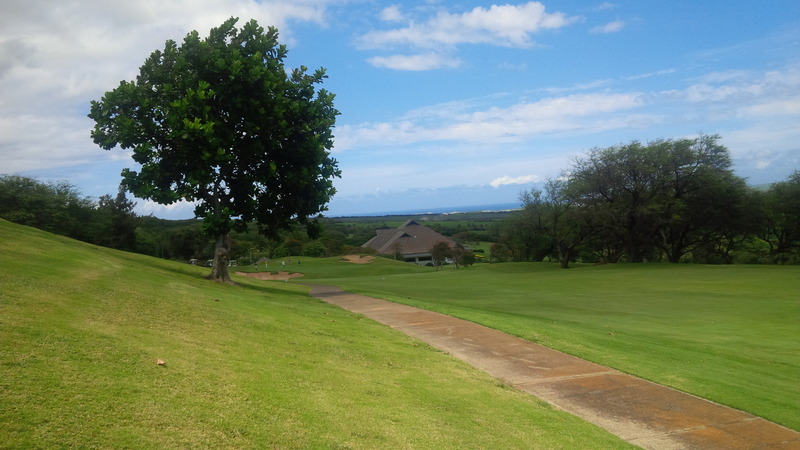 With views of Maalaea Bay omnipresent, one couldn’t help but know that they were in Hawaii, even from the golf course. Most of the elevation change in play occurred on the par 3 holes in either direction, with No. 13 in particular proving an incredible challenge: 50 feet downhill from tee to green with a 30-40 mph wind directly behind us. Needless to say I missed the green. Poorly. The green to tee path absorbed the brunt of the elevation changes, as the golf holes switch-backed their way up and down the mountain’s base. 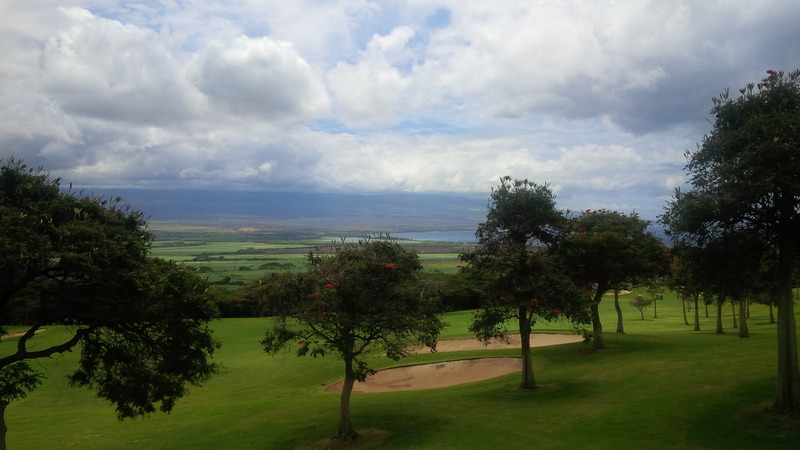 With fields of sugar cane abutting the lower side of the course, it was truly difficult not to be distracted by the amazing views of the West Maui Forest Preserve, and both Kahului Bay to the north and Maalaea Bay to the south of the island. 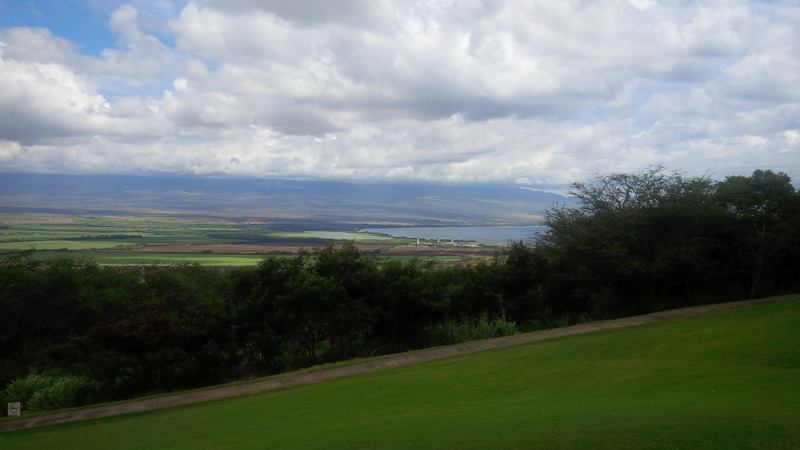 A hooked drive on 11 left the ball a foot below my stance, with views of Kahului Bay adding to my distraction. Despite the clean layout of the fairways, Kahili possesses resort course qualities that contradict any inkling of a parkland designation. Most of the fairways were wide open, with a minimal penalty incurred if your ball was in the rough, just off the fairway. Kahili had an abundance of fairway bunkers, but it was an obvious mistake if you hit into one. However, if you missed a fairway to either side, you were likely to stuck in the side of hill with the ball up to two feet above or below your stance, or forced to pitch out around a grove of trees. Kahili generally had large well protected greens without a flat spot on any of them. Kahili’s greens were Bermuda grass, and it took me at least 6 or 7 holes to wrap my head around the entire “against/with the Grain” concept. With the green at least 50 feet below the tee and a 30-40 mph wind at our back, the par 3 13th hole became a calculus problem I couldn’t solve. The par threes were the real stars of Kahili. Uphill, downhill, into the wind, against the wind, short, long, forced carry, the full gambit of thrills all within four holes. For my early afternoon tee time, I was paired with a lovely couple from San Pedro, California. They were the perfect pairing for me: golf enthusiasts, quick players, exhibited good golf etiquette all day, and appeared to have as much fun as I had. They were both better golfers than I was on this day, but I didn’t have any trouble keeping up. Despite our disparate origins, we collectively found a lot of common experiences and conversation points. Zip lines were whirling by overhead perhaps only 100 yards or so up the mountain from several of Kahili’s holes. We even discussed that they were who I hoped The Wife and I might be in a few years, if she sticks with her clinics and lessons. Bob revealed that Diane got into golf seriously because she grew tired of being a golf widow on the couple’s vacations. It all sounded very familiar, and gave me hope for the future if I do end up with a golfing Wife. Kahili has a nice range, and the pro shop and starter staff could not have been friendlier. Kahili provided a full set of Nike clubs for me to rent, which provided an interesting test drive of some clubs I probably wouldn’t otherwise consider playing. I know now I’d never purchase a set of Nike clubs. After I bent the 5-iron at the hosel with a clean strike on the 8th tee, Nike’s fate with me was sealed. The best part of the Nike set of clubs was the putter, which very similar in style and feel to my Odessy White Hot No. 2, so after I got acclimated to the greens, I putted pretty well on the day. It looks so peaceful, but pictures and my writing can’t do justice to just how windswept the entire Kahili Golf Course was during our round. You won’t find Kahili on any “best of” lists for Hawaiian golf, though I’d argue that it should be considered for one of the best values for the cost of the greens fee. 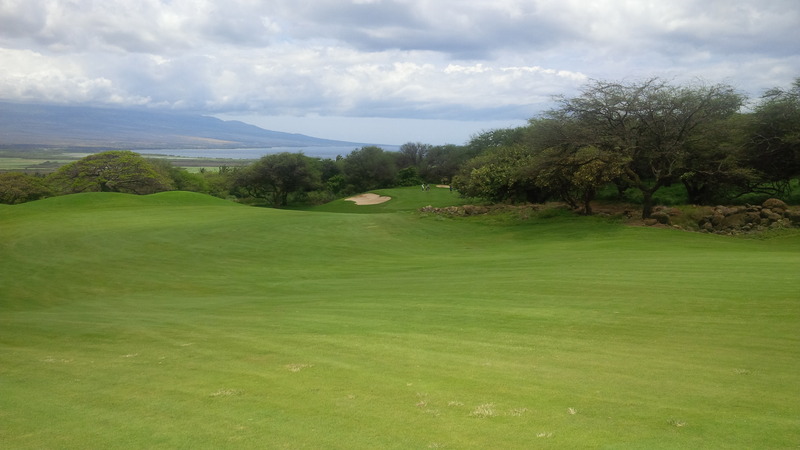 The greens were subject to the Grain, but less so, as it turned out, than the other courses I would play later in the week, so it was a nice introduction to Maui golf. The views of scenic Maui were fantastic, and the course never bored me with interesting combinations of doglegs and elevation changes. The course wasn’t particularly long, and the layout alternates between flowing with and into the prevailing wind. Without any houses to ruin the stunning views, Kahili is a great course with which one can get acquainted with Maui golf. ← May Question of the Month: What is your preferred golf course grass surface? Great pics, Dave. Sounds like you are having a great time in Hawaii. I LOL’ed at the irony of trying out the rental clubs to determine it’s definitely not for you! Well, I rented clubs because I didn’t want to ship them over or fly them with me, as it was prohibitively expensive and didn’t want the hassle of checking them and lugging them around. Plus, I’ll start looking to upgrade my 12 year old Cleveland TA5 irons later this year, so the trip doubled as a chance to see what other equipment was out there. I have not played in Hawaii but sounds like wind and “velcro” greens can make it interesting. I noticed on your trips this year you were going to Hilton Head, when is that trip? When you decide to take a trip inland don’t forget us in Tennessee! Hi Scott. We did the Hilton Head trip the first week of March. It was windy, cold, and wet, but I had a blast. Unfortunately, I think I’m done with these extravagant trips to golf Meccas for a while, outside of the KY’s Best Golf Tour (check out that page if you haven’t already). But, a quick getaway to Tennessee could definitely be a possibility. Thanks for checking out the posts!